The idea of a coffee drone is pretty wild and an IBM spokesperson stressed that not all of their inventions take flight. The barista handing you your cup of coffee might one day be a drone. Plus, the drone could proactively deliver the java, the Armonk, New York-based company's application explained. The drone would assess someone's recent sleep quality via a Fitbit or similar tracking device, electronic calendar (such as the time of day the event is held, the type of meeting it is and who's attending), biometrics, blood pressure, pupil dilation, facial expressions and wake-up time. The drone could cross-reference medications that interact with caffeine and know whom not to serve, if granted access to a coffee lover's medical information. 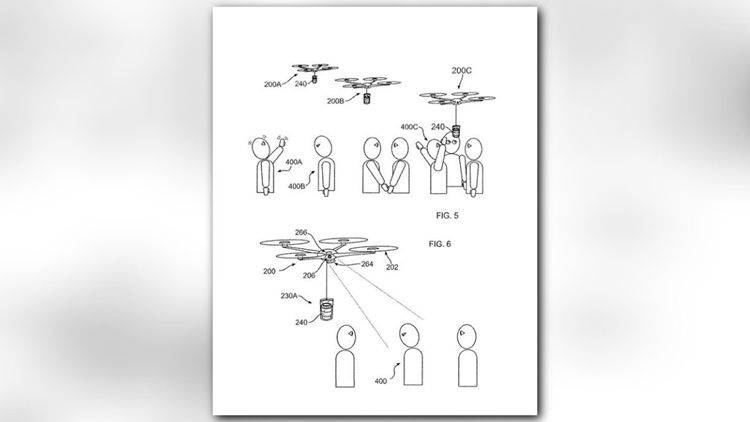 IBM's patent form also envisions applications for bars, where the drone can determine whether a person has drunk too much alcohol by looking for sleepiness (like the head angled downward or drooping eyelids), unsteadiness or slurred speech cues. If any are noted, the drone wouldn't bring any more drinks and would ignore the individual if he or she tries to flag it down. The drone also would determine if any booze was headed to a child – and not serve the minor. IBM has been granted a patent for a coffee drone. These diagrams are part of the application the company filed with the U.S. Patent and Trademark Office. To be clear, these aren't as small as the mini drones people love to fly around in air space. And don't expect a coffee drone buzzing around to bring you your daily buzz any time soon, though. "IBM encourages our researchers to pursue their interests even though not all of their inventions become commercial products," spokeswoman Amanda Carl said in an email. "By publishing their inventions as patents, we give our researchers the recognition they deserve and make their work public, so it can inspire new innovations." To Ryan Calo, a University of Washington School of Law drone expert, the coffee drone proposal is trying to do too much. "It's a combination of technology that is ready for prime time and technology that clearly is not ready for prime time," he said. "It's a drone that flies coffee around. It’s going to be hard, cross referencing all these (factors) ... Why not use a land-based cart?" The answer is simple: People love food with theatrics. Think conveyor belt sushi restaurants in Japan, flambe dishes and burger joints and frozen-yogurt shops that use robots to prepare or serve food. It's how this coffee is served that has Colin Newell, a coffee industry expert based in Canada, raising concerns about safety. "The fundamental flaw here is transporting hot liquids through the air," he said. "It’s a shtick as much as Amazon saying it’ll deliver parcels to your home by drone."